Buy Refeel Sprint Compatible Laser Toner Cartridge 53A for use with HP Q7553A online - Clublaptop - The largest online store by Manufacturer of Laptop Accessories and Spares. This Refeel compatible black laser/toner cartridge has been built to work with your printer. This Refeel brand compatible toner cartridge is 100% comparable to Original cartridges in all terms including its size, appearance and most important print QUALITY. Refeel comaptible toner cartridge is produced under strict quality standards in a manufacturing facility, using state of the art production techniques and equipments to give you the highest print volume and the highest print quality at economical prices. HP LaserJet M2727 MFP,P2014, M2727nf MFPM2727nf,MFPP2015,P2015d,P2015dn,P2015n,P2010. Disclaimer: Warranty doesnot apply to products that has been tampered or experienced problems resulting from missuse and/or improper storage. Refeel is not liable for any indirect consequential or incidental loss/damage. Warranty is limited to replacement of product or refund of purchase price. In case you have doubt or confusion Call us at 9331 39 39 40 or click on LIVECHAT. 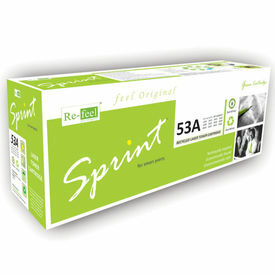 Refeel Sprint Compatible Laser Toner Cartridge 53A for use with HP Q7553A This Refeel compatible black laser/toner cartridge has been built to work with your printer. This Refeel brand compatible toner cartridge is 100% comparable to Original cartridges in all terms including its size, appearance and most important print QUALITY. Refeel comaptible toner cartridge is produced under strict quality standards in a manufacturing facility, using state of the art production techniques and equipments to give you the highest print volume and the highest print quality at economical prices. Save Money, Save Nature. Refeel compatible laser cartridge Features >Made from high quality components > Quality test of 100% products > Original like finish > Higher page yield > Quality at par OEM > Excellent service > Safe and attractive packing > 100% compatible with original laser cartridge Product Features Brand Refeel Sprint Model Number COMP HPK 53AK Color Black Type Toner Cartridge Condition Brand New Compatible Cartridge Page Yield 3000 pages at 5% Coverage Area Warranty Type Warranted to be free from defects in materials and workmanship Compatible Printer Models HP LaserJet M2727 MFP,P2014, M2727nf MFPM2727nf,MFPP2015,P2015d,P2015dn,P2015n,P2010. Disclaimer: Warranty doesnot apply to products that has been tampered or experienced problems resulting from missuse and/or improper storage. Refeel is not liable for any indirect consequential or incidental loss/damage. Warranty is limited to replacement of product or refund of purchase price. In case you have doubt or confusion Call us at 9331 39 39 40 or click on LIVECHAT.